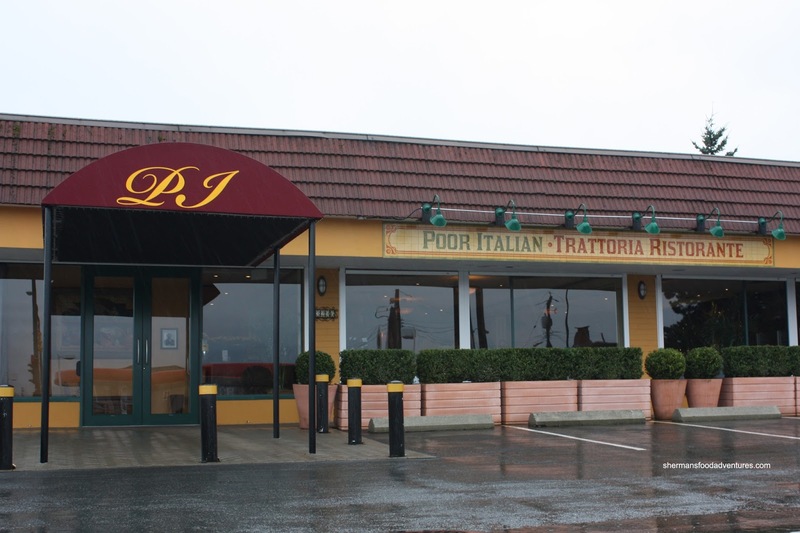 Other than a small tasting roughly 5 years ago, I haven't had a sit-down meal at The Poor Italian since 2011. To see it still there is somewhat of a surprise because the location hasn't fared well in the past. My original visit yielded respectable eats at a premium considering the Downtown-pricing for an Eastside eatery. 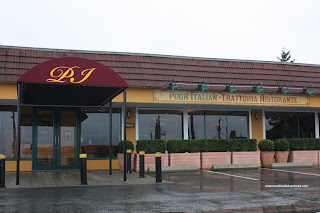 Hence, I never did make any plans to return since there are many less pricey choices for Italian fare in town. However, Costanza chose the place for his birthday dinner since he has been curious about the place for quite some time. 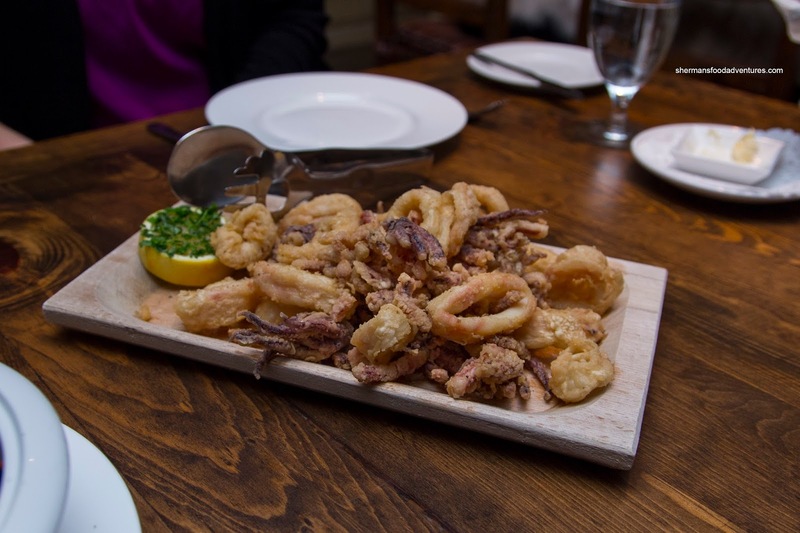 We decided to change things up a bit going for 2 appies, 3 pastas and 3 entrees staring with the really large portion of Calamari Fritti. Even though it was $16.00, the wooden board of calamari still seemed like a good value. It consisted of largely cut rings and tentacles that were battered lightly. Although a touch greasy, the exterior was crispy while the squid was tender with a nice snap. The side of lemon was necessary as the batter was not seasoned aggressively. 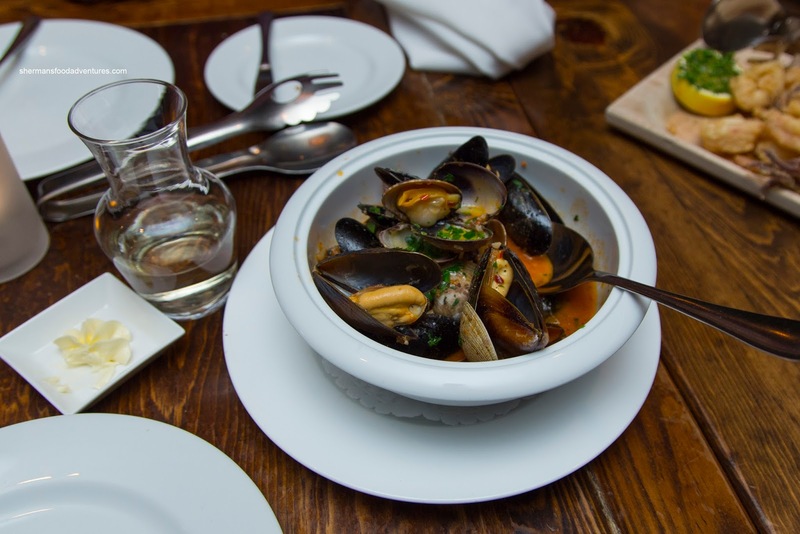 For our next appie, we had the Misto di Cozze e Vongole (Mussels & Clams) prepared in a light tomato sauce with Mediterranean herbs and dry white wine. This was on point as well where both mollusks were buttery, meaty and tender. The broth was superb being aromatic and impactful. The wine was properly cooked down and the tomato was only lightly tart. 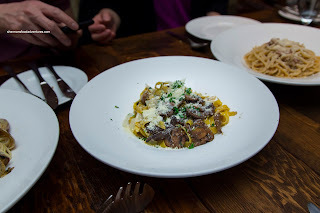 For our pasta course, my favourite of the bunch was the Tagliatelle con Funghi with wild mushrooms, white wine, truffle oil and shaved parmigiano. Although a touch softer than I would've preferred, the pasta was still appealingly textured being tender and slippery. This was due to the liberal use of olive/truffle oil in the dish. That didn't bother me though as the amount of truffle oil was used with restraint. Layers of woodsy flavours came through as well as the saltiness from the cheese. 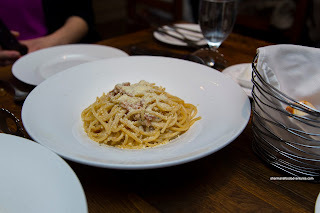 My second favourite was the Spaghetti Carbonara with eggs, smoked pancetta, parmigiano reggiano and cracked black pepper. This exhibited a classic flavour profile with the creaminess from the eggs and the saltiness from the pancetta and cheese. There was a touch of spice from the pepper and the pasta was perfect being chewy while cooked through. 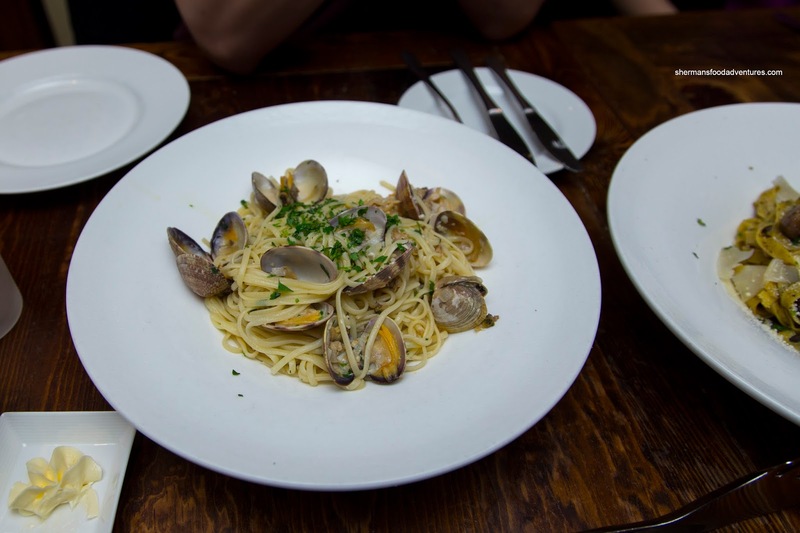 Costanza and I were pretty excited to try the Linguine alla Vongole featuring local baby clams, garlic, white wine and EVOO. Although it looked promising and technically good, it was our least favourite. The pasta itself was a little overdone where it lacked any chewiness. Although there was a good amount of fresh clams, there was a surprising lack of brininess and salt. Hence, the dish was a bit bland. Furthermore, it was unnecessarily greasy from the liberal use of EVOO. Moving onto the bigger dishes, the Grigliata di Carne Mista (Trio of Meats with Calvados Demi-Glace) was a complete disappointment. The chicken was stiff and dry while the medium sirloin tasted funky. Only the chorizo was somewhat appetizing. Fortunately, the Vitello al Marsala (Veal Scaloppine sauteed with butter, mushrooms and marsala wine reduction) was much better. 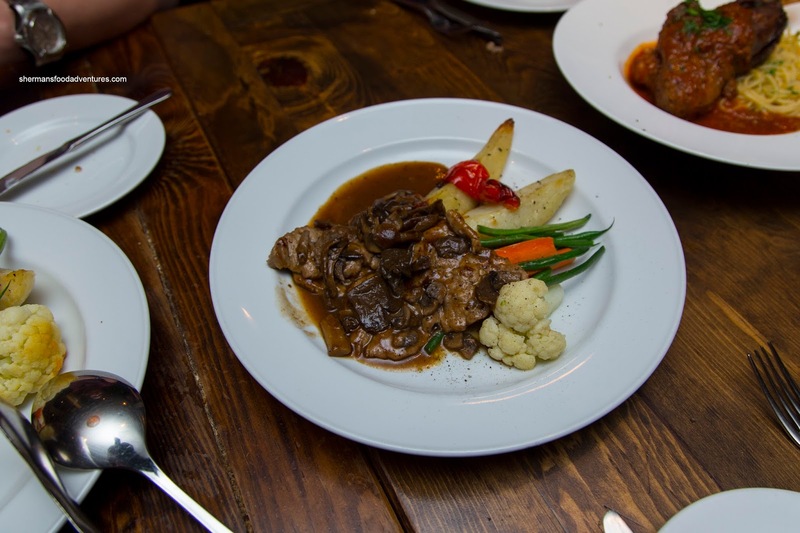 Featuring tender and thin slices of veal, the dish benefited from a beautifully prepared sauce that was woodsy, aromatic and full of depth. I thought it was well-balanced and not overly heavy either. 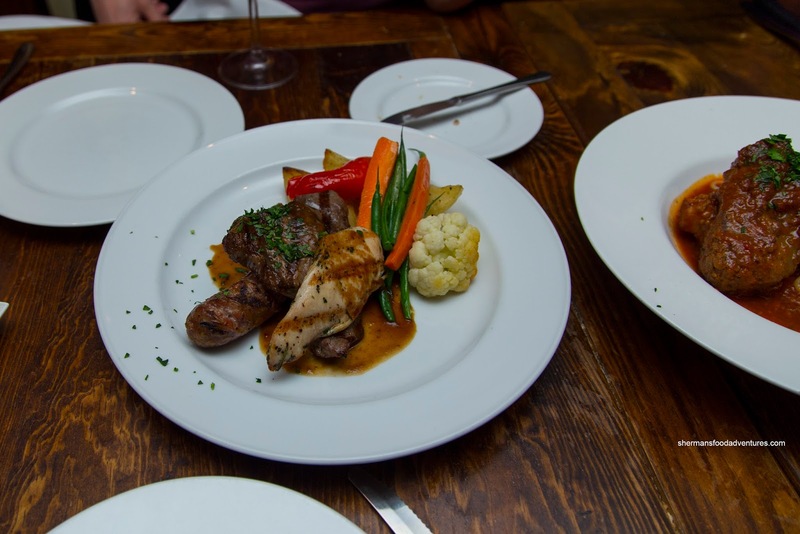 The sides of veggies were vibrant with a firm texture while the roast potato was soft and well-seasoned. For our last dish, we had the daily feature being the Osso Bucco di Agnello (Lamb Shank) with a tomato sauce, garlic, white wine and herbs. 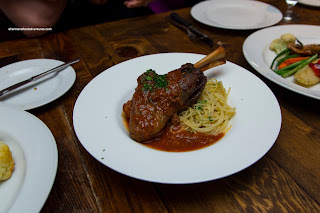 The lamb itself was generally tender and moist with a few drier parts on the exterior. Underneath, the spaghetti was on point and went well with the tangy and garlicky sauce (which was a bit too salty). Overall, we found the appies and pastas to be much more superior to the entrees. Considering the pricing, we expected better execution.